Isn’t it exciting to find free food from the garden? I’m not talking about edible weeds this time, even though that would be exciting too. I’m talking about real cultivated vegetables. Like turnips. I found turnips when I didn’t know I had any. Let me clarify. I did scatter the seeds. I just didn’t know they would give me a harvest. Remember my horsetail problem? Well, part of my experiment in eradicating the horsetail was to plant turnips thickly on the weed-invaded site. Supposedly turnip roots discourage horsetail. 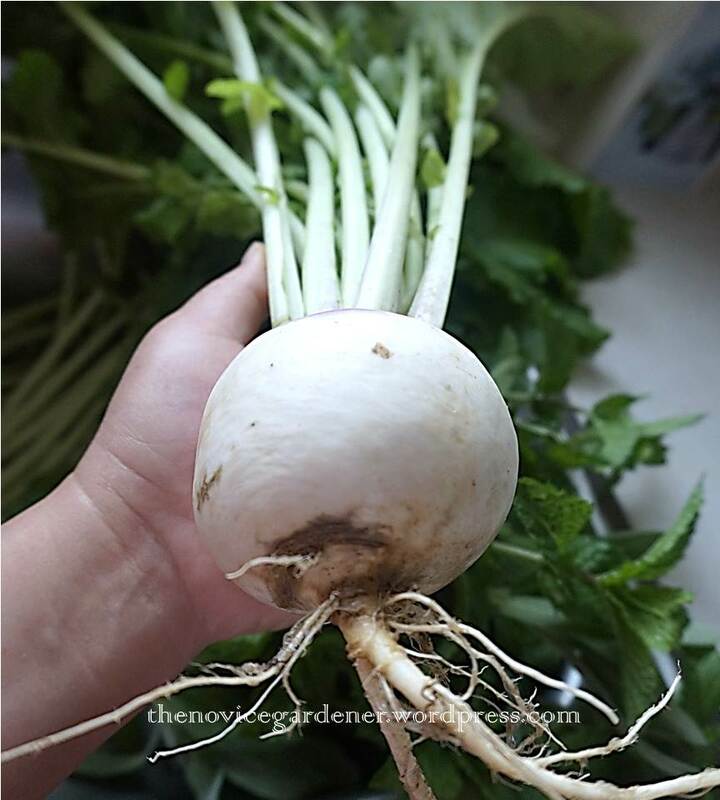 But only if planted thickly, meaning you won’t get a harvest, except for the green tops, because there isn’t enough space for the turnip roots to grow bulbous. So it was definitely a happy surprise to find a few turnip roots heaving out of the dirt, underneath all that foliage. One was huge! It was an even happier surprise to see the family devouring the scalloped potatoes without questions, even though turnips were added into it. TB might have muttered something, but I totally ignored him. Do I really need to post the recipe for this? Recipes are actually hard for me to write, since I usually cook without measuring, relying instead on sight and taste. Especially for scalloped potatoes, which is essentially just sliced potatoes in milk or cream and thrown in the oven! Let me just describe what I did. First, I sliced the potatoes and turnips thinly, and arrange the slices in layers in a baking dish. Then I made the white sauce. I sautéed sliced onion in a little butter/olive oil, added just a tsp of flour when the onion wilted, and stirred the flour to distribute evenly. I added milk and cream (I usually add twice as much milk as the cream, but you can do half and half, if you like), and cooked til the mixture is bubbly and slightly thickened. I poured this mixture over the potatoes. There should be enough liquid so it comes up to just under the potatoes. Bake in a 375° F oven for about 1 hour. Check half way through, to make sure the top doesn’t burn, and the sauce hasn’t dried. If you feel that the top is too brown, you can cover loosely with aluminum foil. And if you feel that the sauce has dried up, add more milk. Now, what to do with all the turnip leaves? They’re kind of prickly, you wouldn’t think they’ll make good eating, but they do. 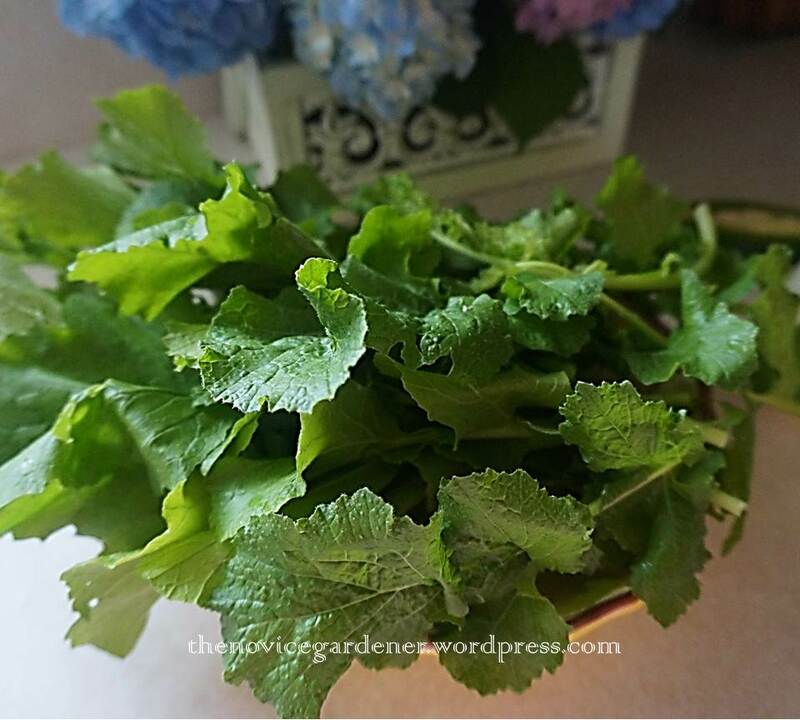 Turnip leaves are beloved in the South, stewed with ham hocks or salt pork. But today, I’m making them into an Indian dish called thoran. 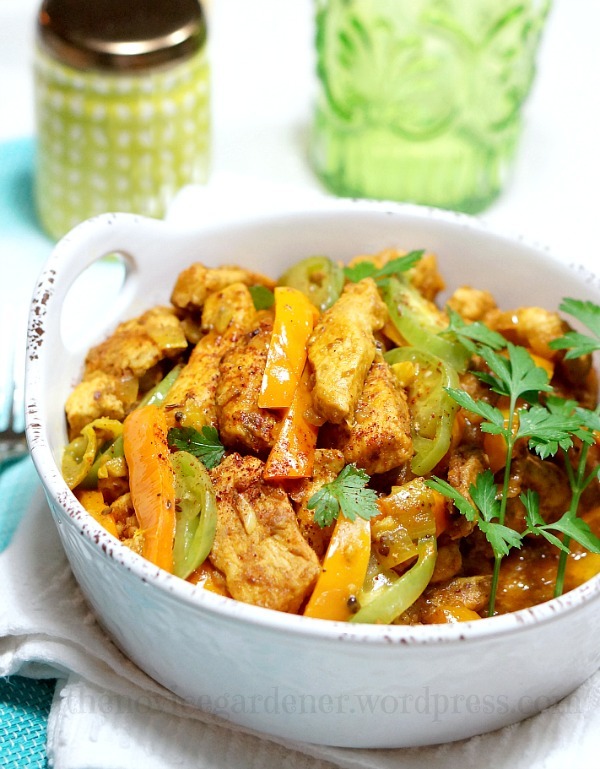 It is basically a stir fry dish consisting of vegetables, shredded coconut, and a few spices. 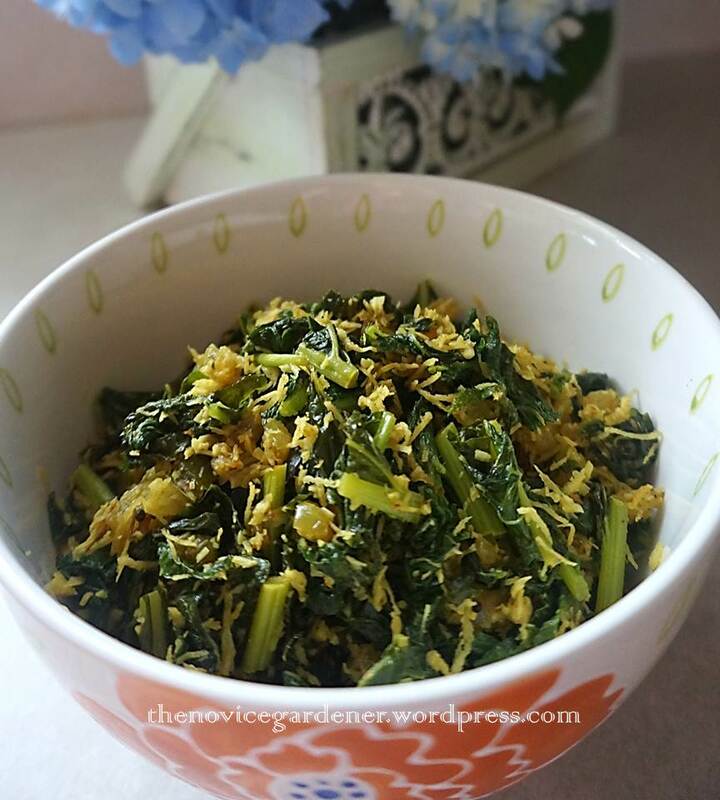 It is quite similar to an Indonesian dish called urap, one of the most interesting preparations of steamed vegetables, and certainly one of my favorites. Remind me to show you how to make it next time. It’s great eaten with Nasi Kuning (Indonesian Yellow Rice). 1. Heat oil in a skillet, add mustard seeds and let them pop. 2. Add the chopped onion and green chile pepper. 3. Sauté til onion is transparent. 4. Add turmeric powder and cumin, stir. 5. 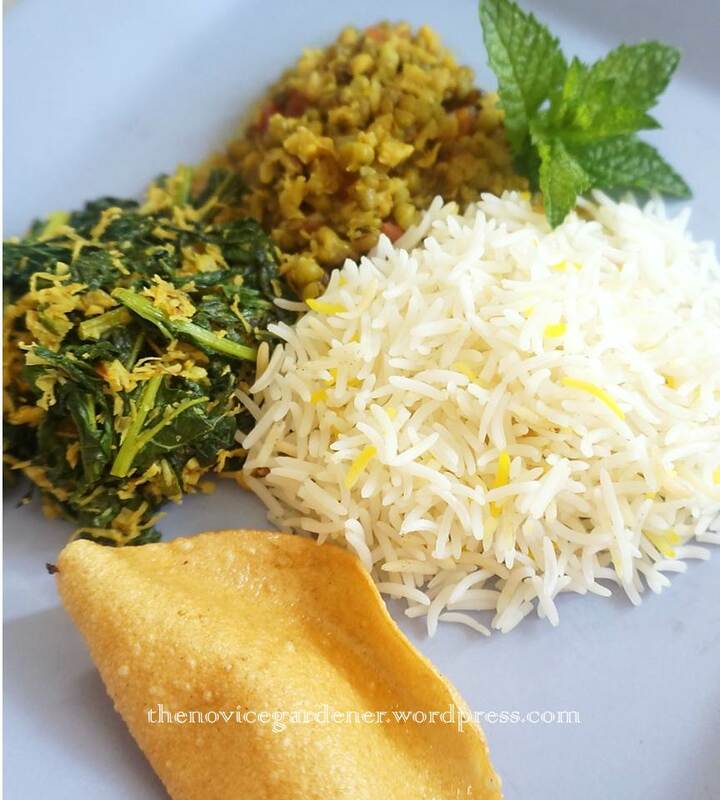 Add your vegetables and the grated coconut. (You can use any vegetable, by the way). Add salt & pepper. 6. Continue stirring until vegetables are cooked. Depending on the type of vegetables you use, some liquid/juice might exude. Cook until liquid evaporates. The final dish should be dry, not watery. 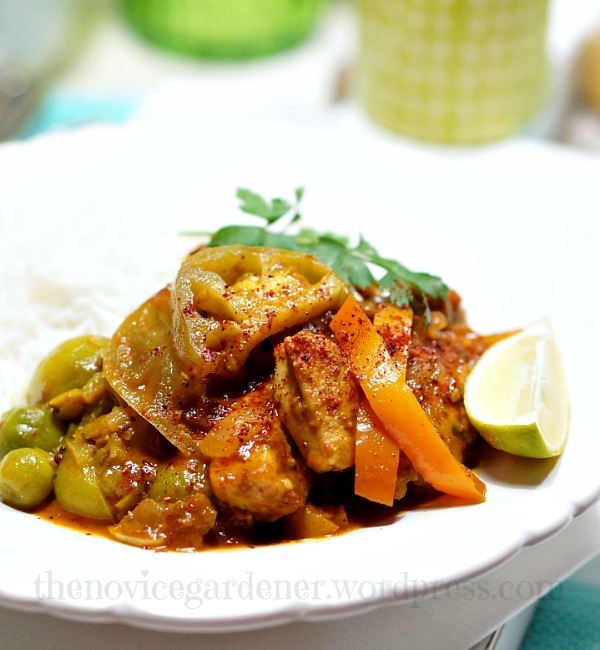 Served with rice and daal, it makes for a wonderful vegan meal. That rice, by the way, is leftover from a Chelo Kabob meal from Shamshiry, an excellent Persian restaurant in Virginia, really a stone’s throw from DC. You must visit the restaurant when you find yourself in the area. They make the best rice (Chelo) in the world, and they give you tons of it. Remind me to talk about it next time. 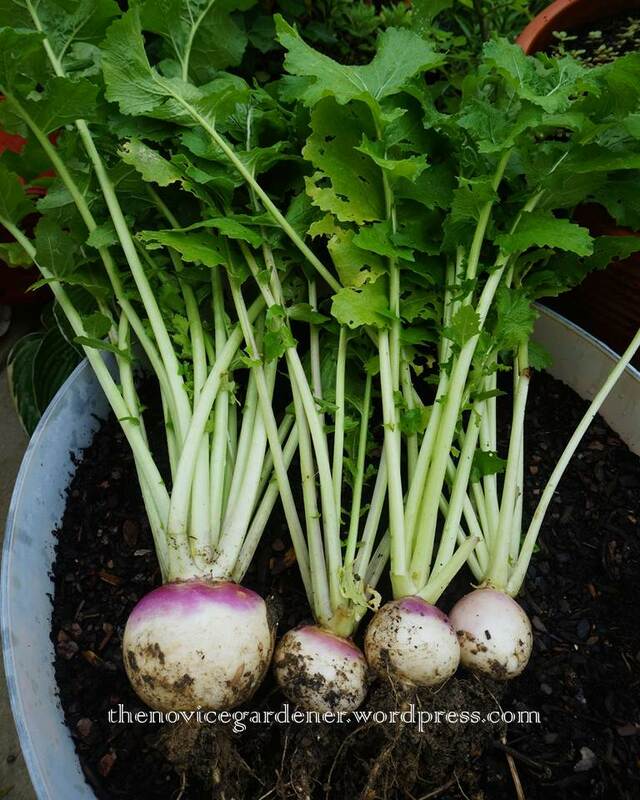 I have a lot more turnips in the garden, albeit more leaves than roots. I wasn’t thinking of food and nourishment when I sprinkled those turnip seeds. I was thinking more of hatred and destruction instead. On the horsetail, you know. But now that I found the patch has rewarded me with good, healthy food, enough for several meals, one word came to mind,” More better!” Make that two words.